News: Most scathing restaurant review ever? A PUNISHING review of a celebrity-owned New York restaurant has gone viral. The brutal take-down of Guy's American Kitchen & Bar by New York Times food critic Pete Wells consists of a series of hostile, often unanswerable questions aimed at owner Guy Fieri. 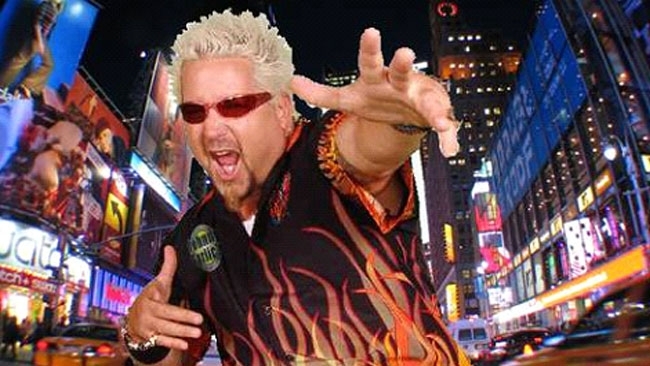 Fieri, who co-owns five restaurants in California is pretty well-known in the US. He has his own TV series on the Food Network and enjoys the occasional game show-hosting gig. Thanks to Wells, Fieri's fame is going global - for all the wrong reasons - with thousands sharing the piece via social media networks this week. Topped with the ominous headline As Not Seen On TV, Wells begins by taking aim at the confusing, overly-descriptive menu. "Did panic grip your soul as you stared into the whirling hypno wheel of the menu, where adjectives and nouns spin in a crazy vortex? When you saw the burger described as 'Guy?s Pat LaFrieda custom blend, all-natural Creekstone Farm Black Angus beef patty, LTOP (lettuce, tomato, onion + pickle), SMC (super-melty-cheese) and a slathering of Donkey Sauce on garlic-buttered brioche,' did your mind touch the void for a minute?" "Were you struck by how very far from awesome the Awesome Pretzel Chicken Tenders are? If you hadn?t come up with the recipe yourself, would you ever guess that the shiny tissue of breading that exudes grease onto the plate contains either pretzels or smoked almonds? Did you discern any buttermilk or brine in the white meat, or did you think it tasted like chewy air? "Why is one of the few things on your menu that can be eaten without fear or regret ? a lunch-only sandwich of chopped soy-glazed pork with coleslaw and cucumbers ? called a Roasted Pork Bahn Mi, when it resembles that item about as much as you resemble Emily Dickinson?" "Somewhere within the yawning, three-level interior of Guy?s American Kitchen & Bar, is there a long refrigerated tunnel that servers have to pass through to make sure that the French fries, already limp and oil-sogged, are also served cold?" And then there's the matter of the donkey sauce. �"What accounts for the vast difference between the Donkey Sauce recipe you?ve published and the Donkey Sauce in your restaurant? Why has the hearty, rustic appeal of roasted-garlic mayonnaise been replaced by something that tastes like Miracle Whip with minced raw garlic? "And when we hear the words Donkey Sauce, which part of the donkey are we supposed to think about?" Wells likens the drooping Baked Alaska to a "representation in sugar and eggs of going insane", wonders why the toasted marshmallow tastes of fish and whether "the entire restaurant is a very expensive piece of conceptual art". He concludes with a rating of "poor" but concedes "the well-meaning staff seems to realise that this isn't a real restaurant".